100% cotton bandana featuring custom, retro-style artwork of the iconic Cliff Palace. Available in navy, green, black, and maroon. All colors may not be available year round. Please write your second color choice in the comment field when checking out. 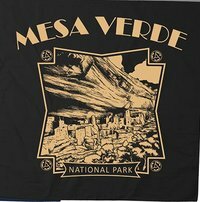 100% cotton bandanna printed with water-based, non-toxic inks and featuring a timeline of pottery from the Mesa Verde region. Images show pottery found in the Chapin Mesa Archeological Museum. Designed and printed in the USA. Approximately 21" x 22".